Grease a muffin mold and place 1 1/4 tablespoon of the dough in each compartment. Use your fingers to apply pressure to the bottom and sides of the mold so as to give the dough a cup-like shape. Bake the dough for 8 minutes. Remove from the oven and allow to cool. Add oil to a hot saucepan then fry the peppers, carrots and garlic for approximately 5 minutes. Salt and pepper to taste. Mix the cream, cheese and eggs in a separate container. Add the vegetables to the quiche crusts, and then cover the vegetables with the egg mixture until they’re filled. Bake for 35 minutes at 350°F. Remove each quiche from the mold and add to a dish or tray. You can make various mini quiches or one large quiche by using a big mold. One problem most parents face is trying to get our children to like eating vegetables. Because of this, we task ourselves with inventing and discovering new ways to 'camouflage' these ingredients in diverse dishes. By preparing these mini vegetable quiches, you'll achieve a unique way to present vegetables, drenching them in cheese or any other ingredient you like. Besides, using refrigerated Pillsbury™ dough helps you save on time and gives you a crunchy gluten-free crust. 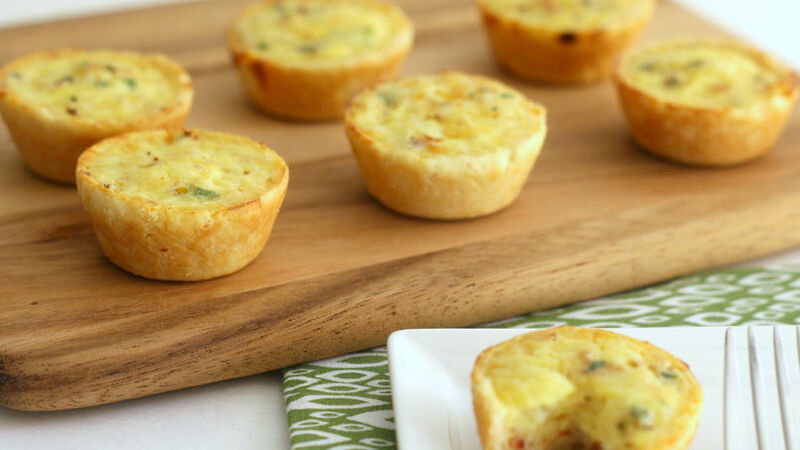 Add this vegetable mini quiches to your recipes for your children and of course, for adult too!